Bike and Canoe Trailers that are specifically Tailored to Family, Outdoor Adventure Groups and to Instructors requirments. They are versatile, compact, lightweight and of a durable design that are no wider than the average car or van. A lighting board and 6 Securing straps are included with each trailer. Extra space for small bikes, luggage, kit, camping equipment etc. Each trailer is adjustable to accomodate almost any bike or cycle. 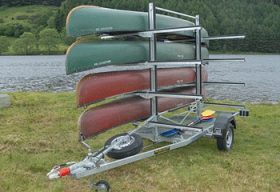 When not being towed the trailers are a very compact portable bike or canoe rack. 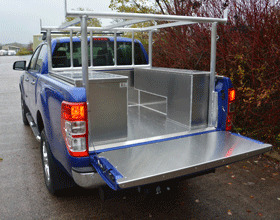 Spare wheels, Jockey Wheels, Storage Rack and Aluminium Storage Boxes are Available as Optional extras.